← Archery – Bogenschiessen – There is an arrow for every event! 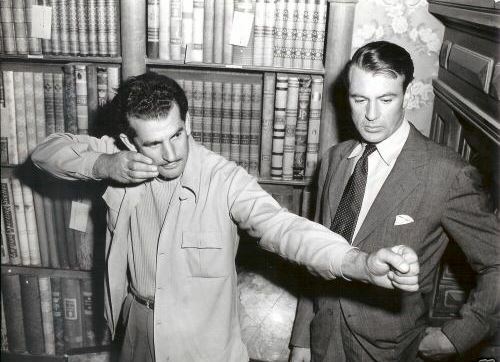 Legends in Archery: Howard Hill explains his unique shooting style to actor Gary Cooper. Howard Hill devoted a lifetime to the promotion of archery, and is still considered the greatest archer/hunter of all time. Howard Hill Archery is owned and operated by archers and personal friends of Howard’s with whom the company was started back in the 1950’s. „WHY I SHOOT THE LONGBOW“ by Howard Hill……It must be remembered that the modern glass laminated bows used today are faster than the bow of past years. I have always said and still maintain that no person shoot a bow he cannot draw with ease. Being first of all a hunter, I wanted a bow that would throw a heavy hunting arrow with as little arc as possible. To achieve this end I knew I would have to increase the pounds pull of my bow, and I worked toward this result. I started with a bow that I could pull easily. By practicing constantly and gradually increasing the pull of my bows, I developed, over a period of years, the muscles to pull very heavy bows with no undue strain. For many years I could handle perfectly bows pulling up to 100 pounds at 28 inches, though my favorite weight for hunting was between 80-90 pounds. Few men have ever spent enough time to develop sufficient strength for handling easily such heavy bows as these. Even at the age of 62 years he could draw and shoot a 75 lb. hunting bow with ease and comfort. Infact, two or three times each week he would shoot a bow of that weight for 30 to 90 minutes, shooting from 110 to 150 arrows. Howard never liked the use of sights or other paraphernalia on his bows. He considered these to be crutches and felt they took away from the challenge of the bow. Also, he liked his bow clean and free of any encumbrances that would hinder the maneuverability of the bow for moving shots. He considered cable and pulley bows something that detracted from the romance of the ancient sport of archery. Hunting with a bow appealed to Howard much more than did target archery. Consequently, his love of hunting was to take him to all parts of the world following the game trails and pitting his skill against all kinds of game, some that nearly cost him his life. Howard’s greatness is probably reflected most in his long list of game taken with bow and arrow, dating back to 1925 when he bagged his first moose and white tail deer while on a hunting trip in Canada. From 1925 until he passed away in 1975, Howard compiled a record of kills that will undoubtedly never be equaled. Dieser Beitrag wurde unter 弓箭手 鹰眼 Bowman Magazine abgelegt und mit Alabama, Avengers, Gary Cooper, Legends in Archery: Mr. Howard Hill 1899 - 1975, Time Warner, USA, Warner Brothers verschlagwortet. Setze ein Lesezeichen auf den Permalink.